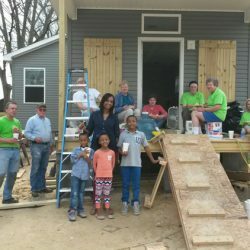 After only 1 month of construction, our new house for the Krystal Dillon family in Independence is looking great! Pictured here are Krystal and her children who delivered lunch to our volunteers on Wednesday March 4th. These volunteers drove all the way down from St. Louis, MO and Minnesota to help us build this house!